A.F. Scott was born in Rockland St Peter, Norfolk, the son of the Primitive Methodist minister, Jonathan Scott. Soon after training as an architect and surveyor, he settled in Norwich and lived there for most of his life. His two sons joined him in the business in 1912. He designed Scott Memorial PM chapel in Norwich in 1902 in memory of his father as well as many other chapels. These included West Acre (1887), Lessingham (1891), Garboldisham (1893), East Runton (1897), Postwick (1901), Lenwade (1905), Runhall (1906), Stokesby (1907), Billingford (1908), Fakenham (1908), Attleborough (1913), and Castle Street, Cambridge (1914) Primitive Methodist chapels as well as Reepham (1891) and Cromer (1910) Wesleyan chapels. 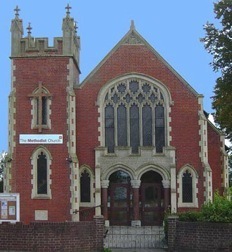 He also designed Cromer (1901), Dereham Road, Norwich (1904) and Wymondham (1909) Baptist churches. Lingwood PM Sunday school (1878) and Queen’s Road, Norwich PM Sunday school (1887) were of his design and so, too, were Wymondham Board School (1894), Ber Street, Norwich UM mission hall (1894-5), Botolph Street, Norwich clothing factory (1903), Bunting’s Department Store, Norwich (1911), Cromer cemetery chapel. A man of extremely strong principles, he was a teetotaller, vegetarian on moral grounds and a strict Sabbatarian. He refused to pay that portion of his rates which funded Anglican schools and when bailiffs removed his paintings, he would buy them back again. He was an enthusiastic cyclist and as a local preacher travelled thousands of miles by bicycle and even cycled to London for business on several occasions. He maintained a Chinese missionary in Western China for many years at his own expense. In 1920 a severe dispute between the minister at Scott Memorial Church, Percy Carden, and A.F. Scott resulted in Scott and his family permanently severing relations with the church. Mr. A.F. Scott is an old “Elmfield boy” who came under the gracious influence of John Petty. He has honoured Elmfield traditions. He is an architect, specially well-known throughout East Anglia. After serving as clerk of works to the Norwich School Board, and assistant to the cathedral architect, without any local influence he obtained the post of clerk of the works to the Liverpool Corporation against 147 other candidates. 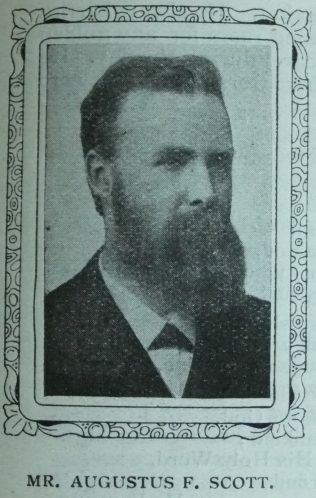 In 1886 he commenced business for himself in Norwich. He has a firm faith in the beauty of the temple as an aid to worship. The towns and villages of East Anglia are dotted with our churches and schools which he has designed. He has won open competitions for Wesleyan and Baptist Churches. But he has been most interested in the fine church on his own station, erected as a memorial to the life work of his father, the Rev. Jonathan Scott. He is also surveyor of Cromer. He carries his religious convictions into his professional work. He will not build a theatre or a public-house. That has meant the refusal of profitable commissions. He has been a local preacher for thirty-five years. For twenty-five years he gave half of his Sundays in the year to this work. He is an independent thinker and clear speaker. He always carries a note-book as a strong room for any golden thoughts he may discover during the day. He is much addicted to hero worship, and his hero is his father.